Seamlessly fulfill the flow from invitation to follow-up after the event with friendly, personal support. Suitable for large company events (think custom forms and automatic invoicing) and smaller events (think sending tickets). Pierrot takes care of all the administrative tasks that come with organising events so you can focus on the event itself. The web app comes with out-of-the-box invoicing, online payment and a small CRM. You might have ticket registration software, but also a dozen excel files and an accountancy to be done. Creating an invoice is clumsy. Asking for payments as well. Too many different files and systems. When did this invoice get paid? Who cancelled? You don't have a clear view on who is interested in what. You're stuck with your registration flow. We help you with the whole flow of registrations, invoicing, contacts and payments. Our application is built on top of proper, but easy, accountancy. Not vice versa. Find all necessary information in one system. Zero learning curve. Learn who registered for what and what that person's main interest is. Follow up with additional tagging, emails and exports. We love to hear from you if you're stuck. How many people registered for your event? Who paid, who cancelled? Pierrot gives you a clear overview. Sometimes you only need a name and an address, but sometimes you also want to know a little bit more about your customer. With Pierrot you can ask your visitor whatever you want! 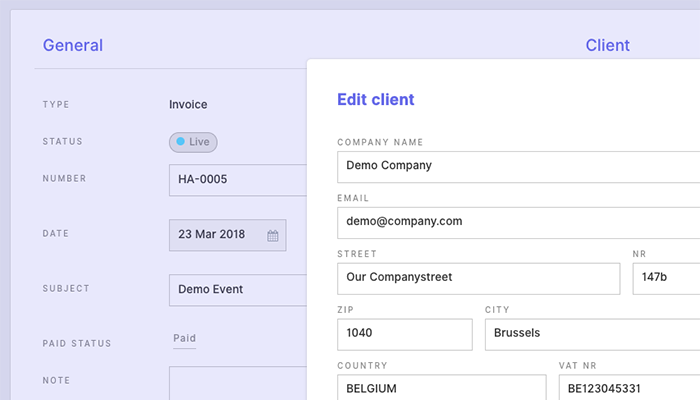 Pierrot can automatically generate invoices if you wish. Someone cancelled? No worries, let Pierrot generate a credit note for you and you're done. You want to send a thank you message to all the people that attended your event? Pierrot can help you out! Registration emails can be fully customised with HTML & personalised. Pierrot works in three languages (nl/fr/en). You can enable one or more languages per event. You can control the fields on your registation form. So if you want to know the shoe size of your attendees, you can. Some people need an invoice before they can pay for something. Pierrot knows that and has you covered! As an organiser you can generate coupons so you can offer special discounts. 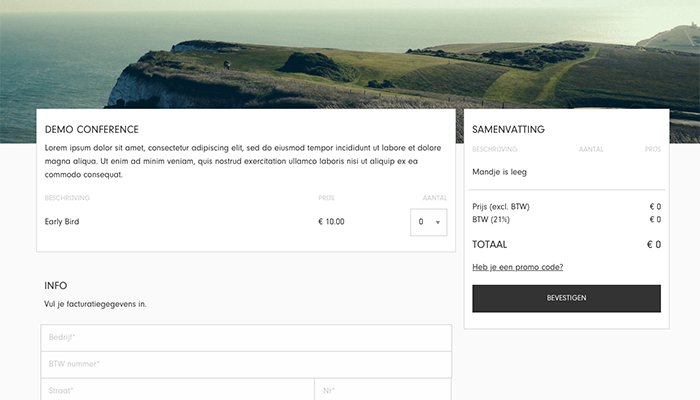 You can set up automatic discount rules (e.g. get a €30 discount when you order more than 3 tickets). 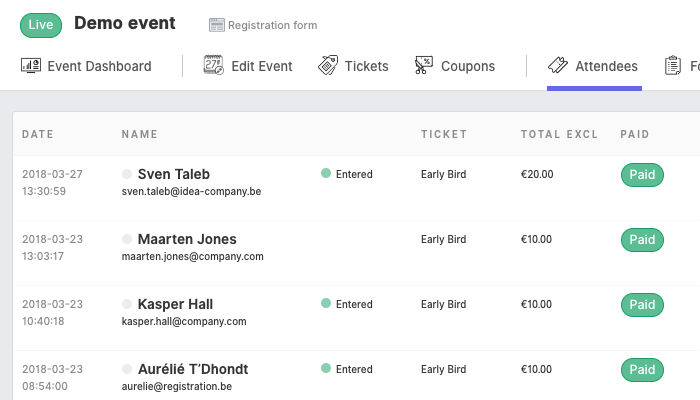 Pierrot enables you to set-up both really simple and really complex event registration forms. Pierrot offers a free iOS app that enables you to scan barcodes fluently at your event. Pierrot works on top of the payment processor Mollie. So all credit card and bank wires go straight to your account. Specifically designed to speed up ticket sales in the box office with automatic prints. Pierrot was created with full customer service in mind. So if you have high standards for your customers in mind, feel free to give us a shot. We're working on a fully automated account set-up at the moment. So do not hesitate to contact us if you want a quick demo.